Hold onto your socks, I'm going to share a pillow tutorial with you! This was my first time using foundation paper piecing. It was easy, and the results are fantastic - if I do say so myself! I followed the tutorial by Jennifer Mathis at Ellison Lane. 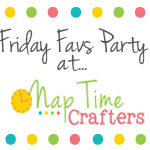 I used the Square-In-Square template from Craft Buds. Here you will find additional tutorials for foundation paper piecing. Since these quilters have already provided foundation paper piecing tutes, I won't bore you with another. Instead, I will share the recipe for this adorable pillow. Because, as you know, there are not enough pillow tutes on the web. Wah-ha-ha! There were 20 5-inch squares in the charm pack. After foundation piecing, 8 charms remained. I stitched the remaining charms into one strip. Then I cut the strip in half length-wise making two 2 1/2-inch strips. I then added the 2 1/2-inch strip to the perimeter of my four Square-In-Square blocks. This made the pillow top come out to 14 1/2-inches square. Perfect for a 14-inch pillow which I happened to have. 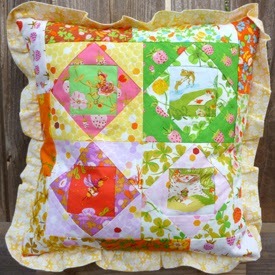 For the pillow backing, I used a yellow floral print that I already had. I cut two pieces that were 14 1/2-inches by roughly 9-inches. The pieces need to overlap. I had just enough sashing left over to make a contrasting flap on the back of the pillow. Score! I folded and ironed the sashing, wrong sides together, and then serged the sashing onto one of the back pieces, to the 14 1/2-inch side. Next, I ironed and topstitched with 1/8-inch. Beautiful! On the other backing piece, I folded the long side over 1/2-inch, ironed, folded over another 1/2-inch, ironed, and then topstitched with 1/8-inch. Whew! Since the pillow is 14 1/2-inches in length, the perimeter is 58-inches (14 1/2 times 4 sides equals 58). Yes, I can still do math! Shocking! For the ruffle, I cut a 3-inch strip longer than 58-inches. Seriously, I think mine was about 64-inches. That makes for a very gentle ruffle. If you want more ruffle, make your strip longer. Sew the two ends of the strip together , right sides together, so you have one humongous tube. Then press the strip in half lengthwise making it a 1 1/2-inch tube. Now, it's time to baste stitch. Set your machine to the longest stitch length. Mine is 5.0, and stitch 1/8-inch basting stitch row along the raw edge of the tube. Do not backstitch or lockstitch. I do one basting stitch row because I'm lazy, but some people do two or three parallel basting stitch rows. Can you imagine?! It's up to you. Now to create the ruffle, gently hold the top thread, and pull the fabric away from the top thread. Do this and take a picture for some extra fun. Heehee. You'll want to ruffle your strip until it matches the perimeter of your pillow. In my case, that is 58-inches. Then distribute your ruffles evenly. When everything is nice and even, pin the ruffles to the pillow top, right sides together and raw edges out. Almost done! First, I laid the backing with the sashing down, right sides together. Then I laid the second backing piece with the right side down. All raw edges are together now. I serged around the pillow. If you don't have a serger, just stitch 1/4-inch around the pillow (remember to set your stitch length back to 2.2), and then zigzag stitch around the pillow too. Done! Turn that pillow right side out. Hold onto your socks! That is one gorgeous pillow! Your cat will love simmering down on this cushion of tranquility. Oh, yeah! Thank you for visiting Good Golly Ginger. What a beautiful use of Briar Rose fabric! Thanks for sharing. Lovely work and the fabrics are so pretty!Thanks so much for sharing the great tutorial! Would love to have you visit my blog sometime.